Even historic foodies love the convenience of “heat and eat” foods after a hard day at work, except in my case the “heat and eat” has been lovingly made by me and frozen in anticipation of a cozy evening when there just isn’t time to cook from scratch. One or two Saturdays a month I cook all day, we have one dish for dinner, and freeze the remainder. Yesterday it was lasagna – a combination of the traditional meat sauce and veggie lasagna. Heavenly! Traditional noodles were layered with meat, veggies, tons of cheese, and from-scratch sauce made from Italian tomatoes. The sauce was scented with fresh herbs from right outside my kitchen door. I sautéed slices of eggplant – skin on. I love the color it adds not to mention the chewy texture the peel adds. I sliced button mushrooms and rough-chopped portabellas and sautéed those in olive oil with sea salt and white pepper. I did the same with slices of zucchini. For the meat I used a combination of ground chuck and alligator sausage left from last week’s kitchen adventure. 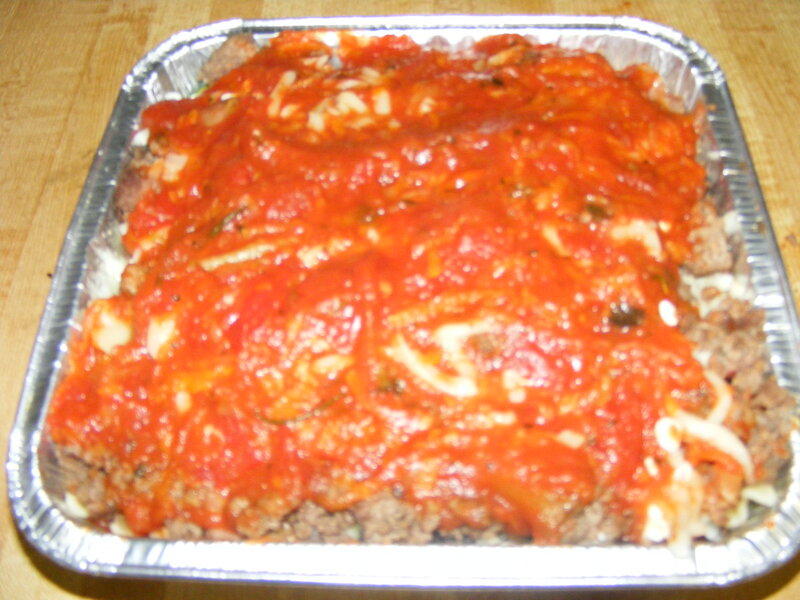 By combining the meats and vegetables, each bite of the lasagna has a different taste and texture. The clean fresh taste of the zucchini contrasts with the earthy goodness of the portabellas, and the eggplant either provides a chewy texture in bites with the peel or a creaminess that is divine. One dish was dinner last night and there are three more safely tucked away in the freezer. All we need do is thaw them, allow them to come to room temperature for a half hour or so, and then bake at 350 to 375 for about an hour and viola! – freshly baked lasagna without the hours of prep making sauce, slicing and sautéing vegetables, and boiling noodles. Oh – since this is a blog about historic foods, I assure you, lasagna has been around well long enough to be historic by anyone’s definition. There are three theories as to how it came about – one has to do with the pot it was cooked in rather than the food prepared in it, one (and this is my choice) is that the dish we enjoy today evolved from one penned in the 14th century entitled Loseyn in The Forme of Cury. By way of explanation – payn (however you spell it) referred to bread, in this case good bread. To seethe is to boil or simmer. Lozen referred to a pasta of some sort. Powdour douce was a spice mixture – the exact ingredients and amounts varied from cook to cook. The book title simply refers to prepared (cooked) food – not something laden with curry powder. What we have is a pasta simmered in good broth and layered with spice and cheese, but by 1700 the dish contained tomatoes much as it does today. The Italians are adept at coaxing unbelievable flavor from basic ingredients, but most do agree the name is Greek in origin – remember that cook pot theory. To study Native American foodways is in essence to study native plant and animal life, or ethnobotany. Earthen pots were usually filled with local game and wild or cultivated plants and vegetables, the types of which varied from one region to another. Temperature, soil type, amount of rainfall, and other factors combined to determine what foodstuffs were found in any given area. By their continuall ranging, and travel, they know all the advantages and places most frequented with Deare, Beasts, Fish, Foule, Rootes, and Berries. – John Smith,Virginia. Ladies were charged with carrying provisions, gathering wood, and preparing food for hunting parties as the hunters themselves were concerned with no other activity than the affairs of the hunt. Game and fowl were trapped, snared, hunted by fire-hunting (use of a light to mesmerize deers or other animals in the dark giving the hunter time to bring them down), use of dogs in hunting varied from tribe to tribe. Game and fowl included deer, turkeys, boar, ducks, bison, bear, elk, pigeons, alligators, rabbits, opossums, raccoons, squirrels, partridges, etc. Depending on religious beliefs some tribes ate fish and turtle while others did not, and likewise while some ate dogs routinely, others did not. Early accounts often mention eating snake, especially rattlesnake. Some tribes were much more meticulous in the cleaning and processing of fish and game than others, the least appetizing examples of which are found in most of the early accounts. Large quantities of fish and shellfish were gathered annually by traps, weirs, spears or arrows, poisoning streams, netting, trot-lines, angling, by the bare hand, and by attracting fish to night fires. They were often preserved for winter by drying and smoking. 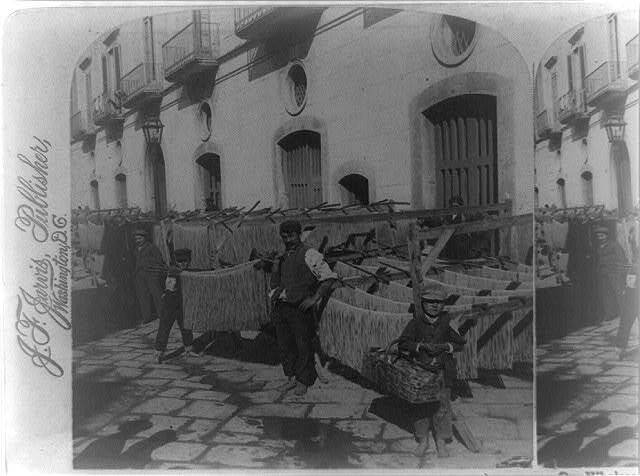 Oysters were dried in quantities enough to last the winter and often transported surprising distances back to villages. The types of fish harvested depended on indigenous species particular to any river or region, including herring, sturgeon, cod, rockfish (bass), bluefish, salmon, trout, jacks, perch, suckers, mullet, alewives, carp, tunny, ray, plaice, garfish, catfish, eels, etc. 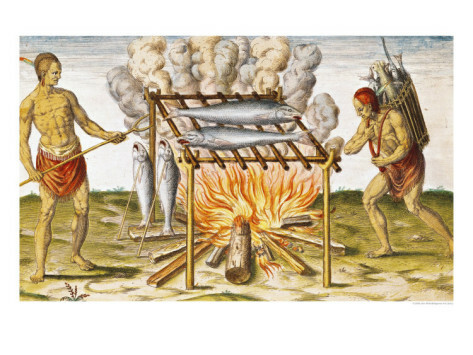 In addition to the preparation of soups and pottages, the methods of cooking fish included roasting over a framework of twigs and coating the entire fish in mud and baking it thus coated in hot coals. When the hardened mud coating was broken away the scales and skin came away with it leaving only the tender flesh. Plants and grains played an important role in native diet – both wild and cultivated varieties. The most commonly recorded varieties of cultivated vegetables included the three-sisters, corn, beans, and squash. This method yielded the highest quantity of produce from a limited amount of space. Beans ran up the corn stalks while squashes grew at ground level underneath. Corn, or maize, was eaten many ways including roasted in its green state (mature ears fresh from the garden). By growing multiple varieties and staggering planting times the green corn season was prolonged considerably. Different types of corn lent themselves best to the preparation of particular foods, some being better for meal or flour or hominy than others, for example. Dried corn was consumed in many ways. It was boiled with meat and beans, made into bread, grits, porridge, mush, and hominy, sometimes referred to as sofki, sagamite, etc. 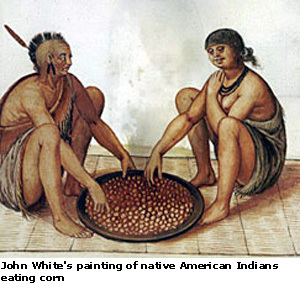 Beans were combined with cornmeal by the Cherokees and others in making bread. Documentation can be found of burning corn cobs and adding the ashes to bread or broth, a practice which Southern women later resorted to during the Civil War when baking powder, yeast, and other leavenings were unavailable. Corn was also used to make a popular drink by draining and straining the liquor from boiled dried corn. Peas, beans (pulse), pumpkin, sunflowers, some melons, nuts of many sorts, wild roots and fruits, cabbage palmetto, etc. played an important role in native diets. With the arrival of Europeans came the introduction to foods such as Irish potatoes (to be differentiated from wild tubers), true sweet potatoes, leeks, onion, cabbage, garlic, additional varieties of melons, turnips, parsnips, etc. Any wild plant that could be rendered edible was consumed. Gathered nuts included acorns, walnuts, hickory nuts, chestnuts, etc., and in addition to eating nuts in the usual manner they were valued for the oil obtained from them (used in soups and in boiling meats and vegetables), and bread that could be made from the roasted nuts (especially acorns and chestnuts). Peaches were among the first cultivated fruits. Valued wild fruits included crabapples, cherries, mulberries, persimmons, grapes (muscadine and scuppernong), strawberries, plums, bilberries (also called huckleberries, whortleberries, and blueberries), blackberries, cranberries, raspberries, etc. Berries and fruits were used to make bread, peach bread for example, pottages, or boiled with any other available vegetables or wild plants. Common cooking methods included boiling, roasting, smoking, and baking in a coating of mud very similar to the method of fish cooking. Meat was often placed onto the end of a sharpened stick which was inserted in the ground leaning toward the fire where it roasted to perfection. 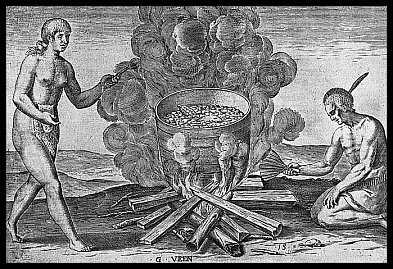 Methods of boiling included boiling in hides, either suspended from a tripod over the fire or by placing heated stones into the hide with the food to be cooked. Earthenware pots were replaced early by traders’ metal kettles, though some tribes were quicker to adopt them than others. The tongues of deer and bison (also buffalo humps), and the tails of beaver were delicacies with many tribes. Bear fat and venison suet were preserved and used in the preparation of food as long as the quantities lasted. Both Native Americans and whites cured bear meat into bacon and bear lard made excellent bread. The most popular method of food preservation was by drying, and this applied to meats, fruits, nuts, grains, and vegetables (cultivated and wild). Large caches of dried corn, peas, beans, pumpkin, and squash were common with many Southeastern tribes. Maple sugar and syrup were documented by many early writers. The Native American diet varied greatly in flavor, quantity, and quality from region to region and from one time period to another. Most ate heartily during times of plenty, and made do, resorting to much poorer quality ingredients and consuming less, during times of scarcity. Almost any statement could be made regarding native foodways in general, but what is correct for one situation is not necessarily correct for another. Prepared foods made significant changes which can be traced to incidents such as the introduction of metal kettles, the introduction of new seeds and cultivation equipment, or even differences in native plants for those who were forced to leave their homes in the Southeast and settle in what many considered the barren wasteland ofIndian Territory. Because of these significant changes in foodstuffs and cooking techniques it is necessary to do lengthy study and research on any period, tribe, or food type in order to arrive at accurate conclusions. Further reading: Swanton’s various books on Southeastern Indians. Rumble, Victoria. Soup Through the Ages, A Culinary History with Period Recipes. Order from McFarland Publishing Co.
A few posts ago I spoke of troops in Washington’s army catching fish to supplement their diets, and they no doubt did this with some regularity as Valley Forge was situated on the Shuylkill River where there were abundant supplies of fish. I visited Valley Forge recently to see where my ancestor, Thomas Gresham, 3rd Virginia, wintered in 1777/78, and am considering what conditions were like and what food was available that winter. 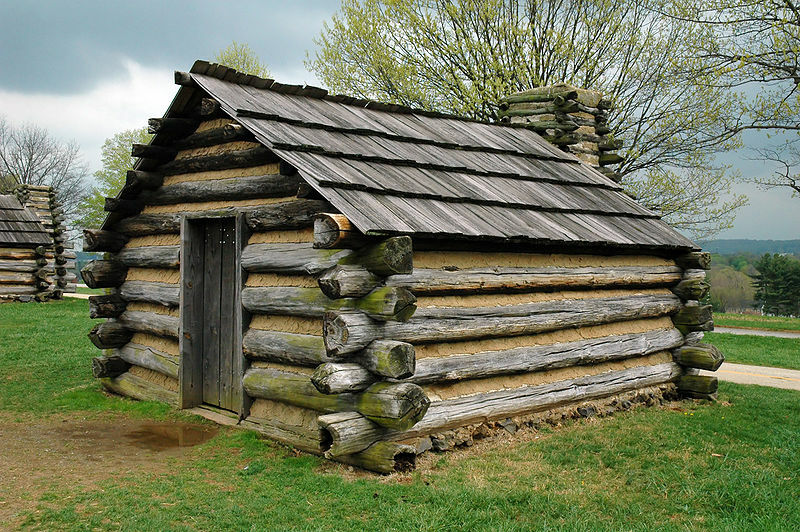 The huts were built per the following specifications taken from Washington’s General Orders of December 18, 1777. 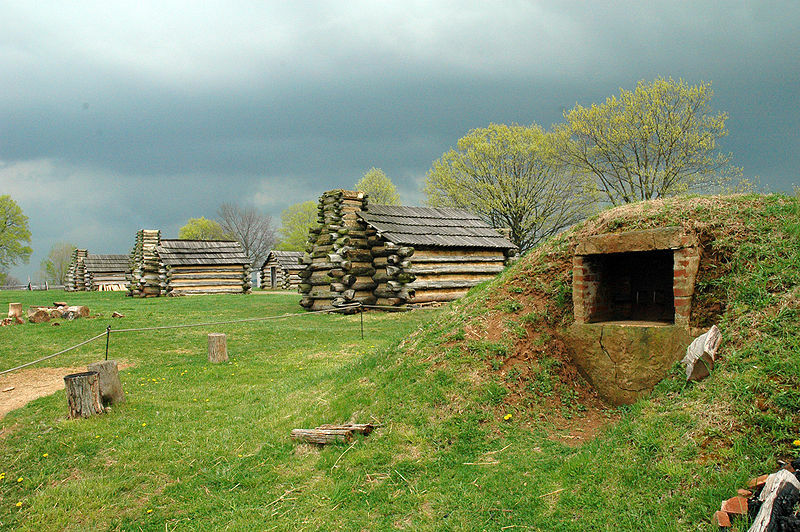 The Soldier’s huts are to be of the following dimensions, viz: fourteen by sixteen each, sides, ends and roofs made with logs, and the roof made tight with split slabs, or in some other way; the sides made tight with clay, fireplace made of wood and secured with clay on the inside eighteen inches thick, this fireplace to be in the rear of the hut; the door to be in the end next the street; the doors to be made of split oak slabs, unless boards can be procured. Side-walls to be six and a half feet high. The officers huts to form a line in the rear of the troops, one hut to be allowed for each General Officer, one to the Staff of each brigade, one to the field officers of each regiment, one to the commissioned officers of two companies, and one to every twelve non-commissioned officers and soldiers. A common theme emerges when researching the foods – shortages. Some 19th century sources spoke of good harvests in the area that year, but those crops were intended for the Philadelphia markets, some 20 miles away, and stores were not given freely in exchange for vouchers the new government, as yet, had not committed to honor. Compounding the problem was the shortage of conveyances in which to transport grain and supplies. Sgt. Andrew Kemp wrote in a letter to his mother they had gone up to a week at a time with only frozen potatoes to eat. Soldiers were dispatched to find hidden supplies and to confiscate them. 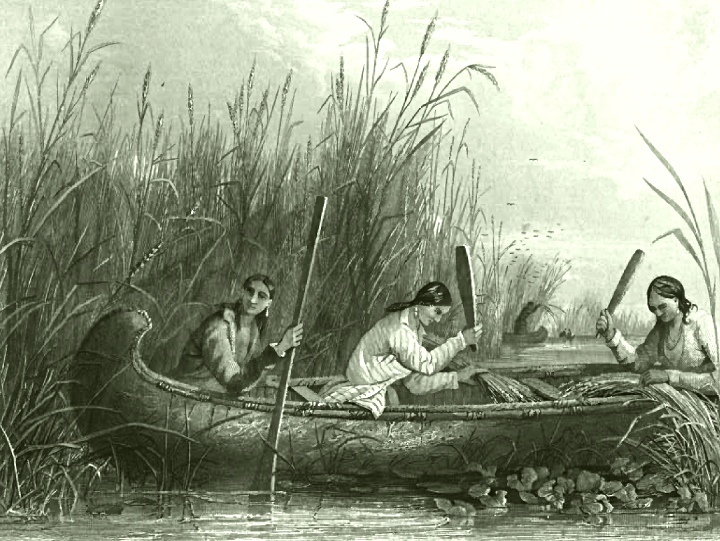 On one outing, they found droves of cattle hidden away in the marshes of the Delaware, also intended for the markets in Philadelphia. One journalist wrote that provisions were so scarce the soldiers had eaten their dogs and that, “cattle, fish, plants and roots made up their chief diet”, and another described a bowl of beef soup with burnt leaves and dirt. There were between ten and eleven thousand men encamped at Valley Forge along with some wives and children. It obviously took a great deal of supplies to keep that many people adequately fed. The camp was about 20 miles from Philadelphia on the Shuylkill River which had fish of several kinds. In a previous article I spoke of catfish that were caught and cooked by a soldier in Washington’s army, and there were trout, shad, and sunfish. Harry Emerson Wildes wrote an elaborate account of a shad run which supposedly fed the troops for several days and furnished enough for hundreds of barrels of salted fish for later consumption. He claimed the, “famine completely ended”, however, he failed to document his source and to my knowledge no one has been able to substantiate that account. I doubt there were sufficient barrels and salt available for pickling anywhere near that many fish. There are accounts, however, of the army and locals purchasing odd barrels of salted fish. While food was never plentiful, with what they could forage from the locals, catch of their own accord, and the meager rations supplied to them, the troops managed to scrape by during that dreadful winter encampment. Rations were: 1 ½ lbs. flour or bread, 1 lb. beef or fish, or ¾ lb. pork, and 1 gill of whiskey or spirits; or, 1 ½ lb. bread or flour, ½ lb. pork or bacon, ½ pint of dried peas or beans, and a gill of whiskey or spirits. Private Joseph Plumb Martin blessed us with an account of how the common soldier may have cooked such rations. How was it cooked? Why, as it usually was when we had no cooking utensils with us,–that is the flour was laid upon a flat rock and mixed up with cold water, then daubed upon a flat stone and scorched on one side, while the beef was broiling on a stick in the other fire. This was the common way of cookery when on marches, and we could get anything to cook… – Martin, Joseph Plumb. Memoir of a Revolutionary War Soldier. 1830. Hallowell, Maine. At other times he ate his fill of walnuts from a tree, roasted a half dozen foraged turnips, and boiled his part of a sturgeon, “seven or eight feet in length”, that foolishly jumped up and fell into the boat as he was helping to ferry troops across the Hudson river. Sturgeon were also found in the Schuylkill – early accounts state they were so plentiful one could walk across the river and not get wet by stepping on the backs of the sturgeon. – Kephart, Beth. The Life and Times of Philadelphia’s Schuylkill. 2007. Philadelphia. Conditions for George and Martha Washington and other officers and their ladies were quite different. The Washington’s ordered food, received food local women brought to headquarters, and on at least one occasion had pickled oysters and cheese confiscated from a British ship. Author Nancy Loane wrote that foods gracing the Washingtons’ table included fowls, partridges, onions, potatoes, cabbages, turnips, parsnips, eggs and veal. She found those items and apples and turkeys listed on expense reports indicating the Washington’s had these items in adequate quantities for themselves and their guests throughout the encampment. Washington also ordered a quantity of good hams. –Loane, Nancy K. Following the Drum. 2009. 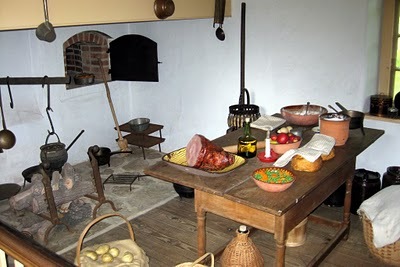 The kitchen at the Potts house where the Washingtons wintered was situated on the banks of the Shuylkill and was quite nice for its day. The Washingtons had two cooks and a troop of servants to see to their needs. Their months at Valley Forge are peppered with accounts of entertaining officers and their ladies. Ms. Loane’s book is well documented and she exposed several previous accounts of Martha Washington’s efforts to aid of the soldiers at Valley Forge as fictional. In 25 years of researching she was not able to locate a single account of Martha taking food to the camps, or even knitting socks for the men, many of whom had no shoes. She traced such glowing accounts back to Martha’s grandson who hadn’t even been born yet during the winter at Valley Forge, and whose credibility was unreliable. Ms. Loane noted that accounts written by other Victorian-era writers and editors are unsubstantiated accounts, influenced by Custis’s remarks, published many years after the war. One of those writers was responsible for the myth of George Washington and the cherry tree. In the case of Valley Forge there are no recipes and few detailed descriptions of food the soldiers and camp followers ate. Knowing what was commonly eaten at the time and knowledge of general food storage and preparation tells us what they at least tried to make from their scanty rations and foraged supplies. There was a bread oven at Valley Forge and a capable baker to supervise its use so we know they had bread made from local grain. Soup would have wasted nothing and could have been made from anything. Meat or fish could have been combined with the peas or beans and any plants or roots available, and fish could have been layered with the hard bread and cooked until it amalgamated into crude chowder. The preserved fish and pickled meat would have contained enough salt to season a kettle full of soup without adding any. Food was never plentiful or fancy, but the troops held together and, as they say, the rest is history. Returns of Provisions Issued, frames 91, 31-32; 34, 250; r75, M859, RG93, National Archives. Journals of the Continental Congress (Washington: Government Printing Office, 1908), 10:235-36. William Kingsford. The History of Canada. 1893. London. Church of Latter Day Saints. The Young Woman’s Journal. V. 3, No. 2. Feb. 1902. Taylor, Frank Hamilton. Valley Forge: A Chronicle of American Heroism. 1920. Valley Forge Park Commission. Duche, Jacob. Washington at Valley Forge. 1858. Philadelphia. Carrington, Henry. Battles of the American Revolution 1778-1781. 1876. NY. Helen Bryan, First Lady of Liberty Martha Washington, John Wiley & Sons, Inc., NY., New York, 2002, pgs. 218-233. Loane, Nancy K. Following the Drum: Women at the Valley Forge Encampment. 2009. VA.